The beauty of physical, human motion is that just about anything kinetic, any gesture can work. If you were left only with motion in your toes, you could play a live set. And whereas these gestures were once tied to specific acoustic instrumental effects, in the digital realm, they can be anything. We’ve seen the rise of the grid controller, popularized by the monome and later seen in mass-market devices like the Launchpad and APC. And while it’s hardly the first “big knob as controller” concept, we’ve seen the encoder celebrated in the monome follow-up arc. So, buttons – check. Encoders – check. How about faders? Herrmutt Lobby has been building simple Max for Live patches that do more with less. Beat Fader assigns note triggers to control points spread along a fader. This is similar to what the monome community have built with a row of buttons, but instead with continuous input. The fader still works like the buttons – instead of tapping a toggle, you move past a control point, for eight events. As you’ll see in the screen patch, the patch itself doesn’t do much; it’s really up to how you configure your Live set. In a similarly economical invention, Counter increments a series of notes from a single trigger. The advantage of Max for Live is that these little creations, long the sort of thing that’d make up a larger patch, now can be dropped as modules into a Live performance set. 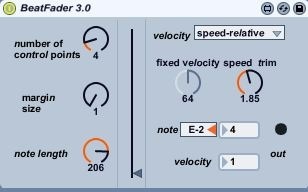 But you could easily use this idea outside Max for Live, in any tool that processes MIDI events, and with or without Ableton. As usual, performance virtuosity is what makes the difference. There’s a nice thread on the monome forum about this to read – thanks to them for inspiring this story.